There’s always more to learn, and the Internet can help you gain knowledge without wasting a lot of time or money. The trick is to find interesting, engaging educational material and sneak it into your daily routine. Podcasts, audiobooks, and recorded lectures are ideal for this sort of recreational self-improvement: You can listen to recordings while you’re stuck in traffic, running on a treadmill, or washing the dishes, without missing critical information or jeopardizing your fine china (or your fellow drivers). This sort of recreational education is no substitute for professional instruction or dedicated training, of course, but it’s a fun way to learn something new and to open up opportunities for you to discover hidden talents or new passion projects. It's a great time to be curious, as the advent of open courseware from prominent universities makes it dead simple to listen to college lectures for free. 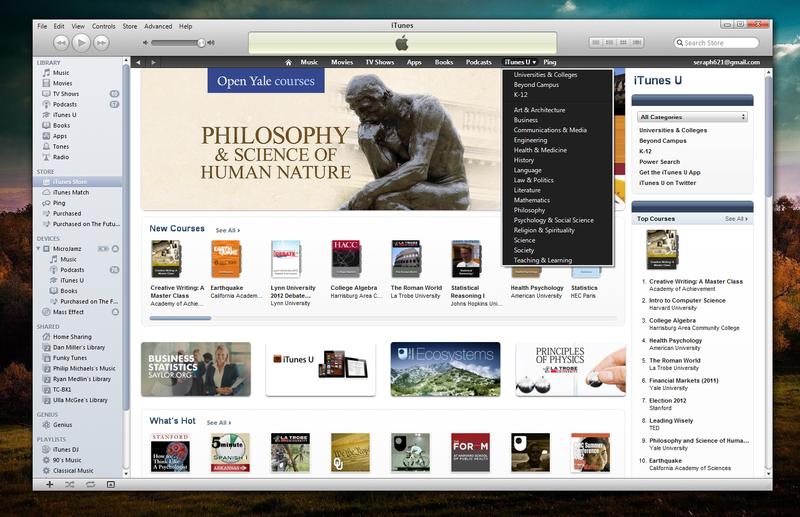 If you have an iTunes account, the iTunes U program is the easiest way to informally enroll yourself (or your ears, at least) in collegiate courses from some of the top educational institutions in the world. Apple established iTunes U a few years ago to assist teachers in distributing course materials to their students, and these days the service has thousands of lectures that you can download for free and listen to at your leisure. To access them, either download the iTunes U iOS app on your mobile device or launch iTunes on your PC and navigate to the iTunes U section of the store. 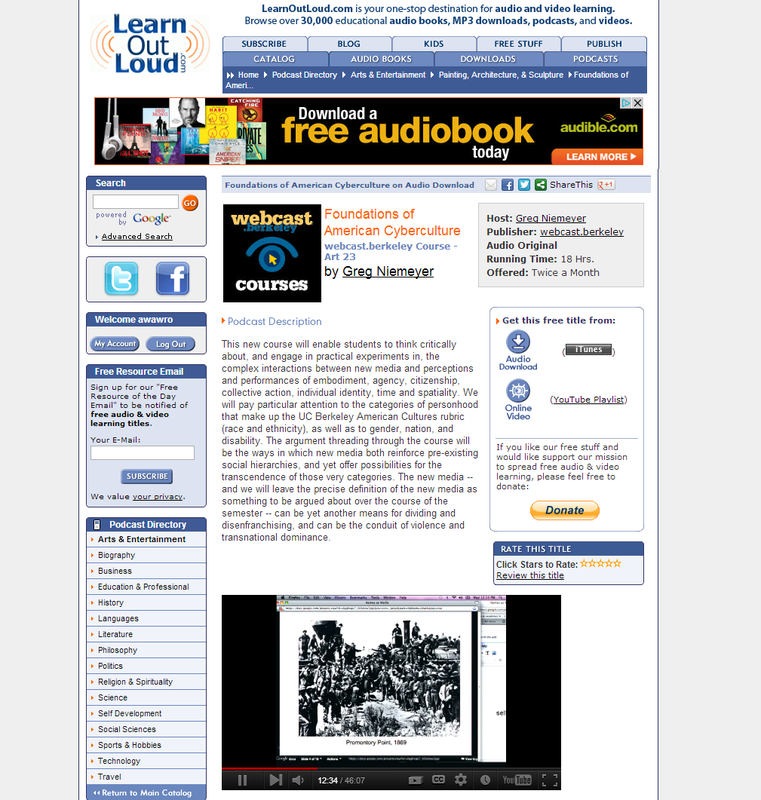 From there you can sort through audio and video lectures from thousands of colleges and universities, and then download items to your mobile device just as you would a podcast or audiobook. 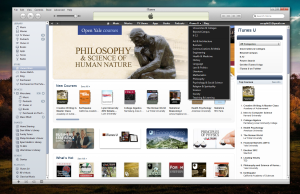 Since iTunes U courses are carefully curated and formatted with iOS devices in mind, iTunes U is the best place to go if you’re looking for high-quality audio that you can pause and resume without losing your place. If the iTunes U course selection isn’t enough for you, open your browser of choice and bookmark Learn Out Loud, a self-professed aggregator of audiovisual educational material. It’s a fantastic resource for self-guided education; and although the site does link to many paid products (such as audiobooks from Amazon), it offers plenty of free material that's worth checking out. The Learn Out Loud podcast directory lists links to download free educational recordings from hundreds of institutions worldwide, including many of the same colleges and universities that distribute free lectures through iTunes U. But the Learn Out Loud directory offers a wider variety of institutions and courses to choose from than iTunes U does, so you’ll find many more one-off lectures, such as a presentation on basic applications for applied genetics from UCLA. However, Learn Out Loud is less strict about the sorts of lectures it links to, and thus many of the lectures listed are incomplete or have poor audio quality (an incomplete lecture on secular Jewish culture is just one example). Of course, even the most interesting college courses still require you to listen to someone lecturing for an hour or more, and if you’re doing it during your commute you don’t even have an opportunity to ask questions or to doodle in your notebook (I guess you could doodle on your dashboard, but fellow commuters might raise an eyebrow). You may find listening to a story much more enjoyable, and the experience can also be edifying if you select a piece of critically acclaimed literature. Most podcast listeners know that Audible constantly gives away free audiobooks as part of its new-subscriber promotion, but you can find plenty of other great sources for free audiobooks. 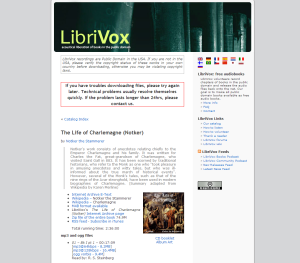 For a broad range of free audiobooks, pop over to LibriVox and poke around in its library of titles, which are assembled from volunteer recordings and available for download as .mp3 files. You can listen to everything from Anna Karenina to Grimms' Fairy Tales, and the site adds more audiobooks every week. Since LibriVox's stated objective is to make every book in the public domain available as an audiobook, it has one of the fastest-growing libraries of free audiobooks around. But since the books are read by volunteers—with varying levels of skill, and in disparate environments—the audio quality of LibriVox recordings can be hit-or-miss. 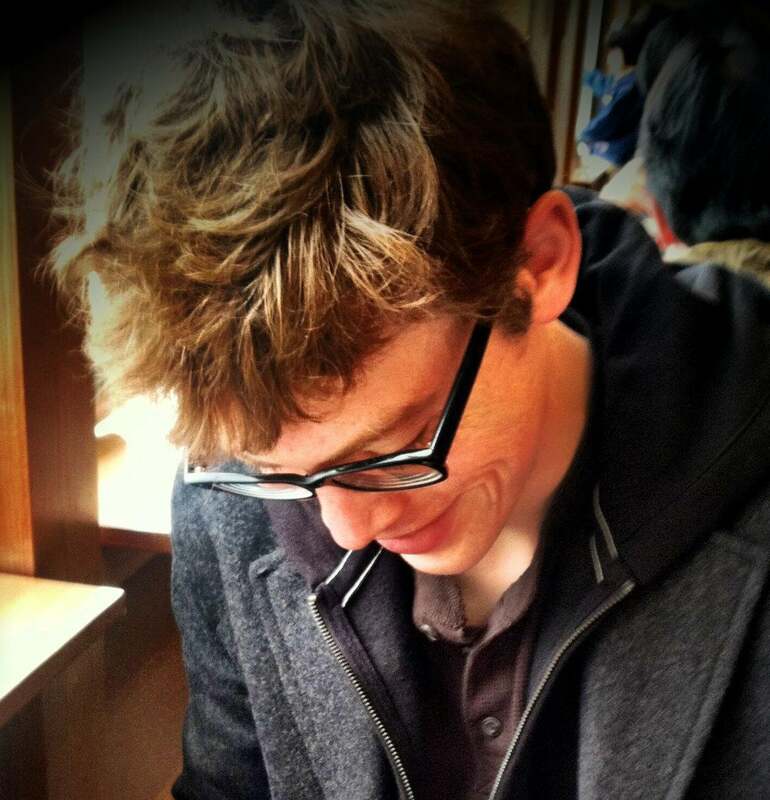 If you still can’t find the book you’re looking for, check out Project Gutenberg, the volunteer project to scan and archive every book on the planet. 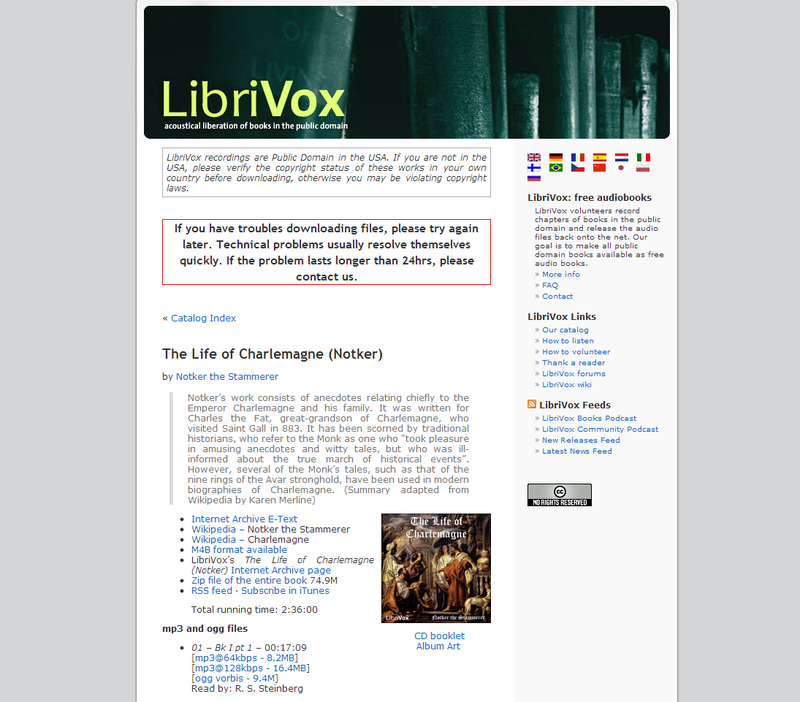 The site hosts a big archive of free audiobooks (read in dozens of different languages) that you can download as .mp3 files, but a little sleight of hand is involved: Even though Project Gutenberg offers more free audiobooks than pretty much any other repository, the site accomplishes that by archiving material from other websites such as AudioBooksForFree and the aforementioned Librivox. Some of the audiobooks on Project Gutenberg aren’t even read by humans; instead, they’re computer-narrated and sound pretty much like what you might imagine if someone typed out, say, a Herman Melville novel on a Speak & Spell. If lectures leave you restless, and if you start nodding off whenever someone reads you a story, consider subscribing to a podcast featuring experts discussing subjects you want to learn more about. The most obvious examples are language-learning podcasts such as Pukka German and Coffee Break Spanish, but you can dig up a ton of fantastic educational podcasts if you know where to look. 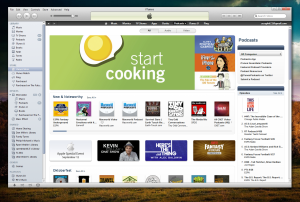 The best place to start is iTunes, which hosts hundreds of thousands of podcasts and maintains an entire educational category devoted to podcasts designed to inform and educate. 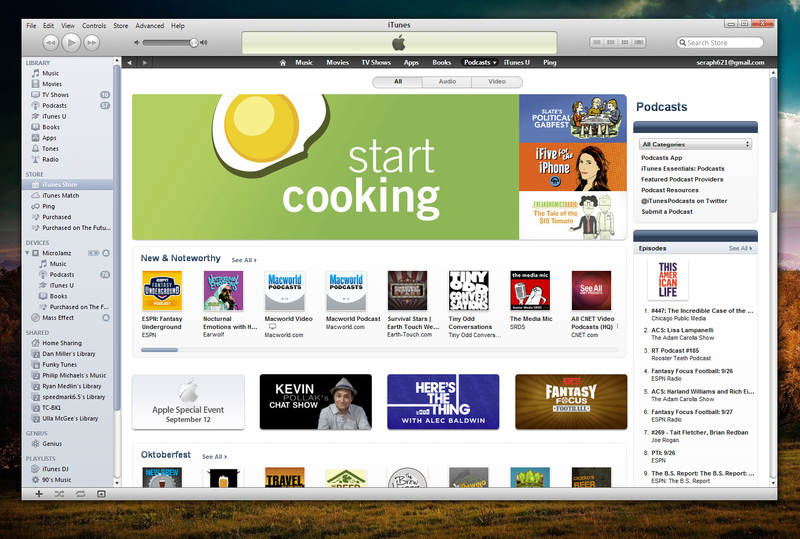 You can find it by launching iTunes and selecting Education from the Podcasts drop-down menu in the top-right corner of the iTunes Store. From there you can browse podcasts devoted to all sorts of topics, from home improvement to the history of European conspiracies to the science of brewing craft beer. Variety notwithstanding, choose a good podcast over a university lecture series or an audiobook if you value humor and efficiency; most great podcasts have an engaging cast of characters from assorted backgrounds moving quickly through multiple topics of discussion, and episodes typically last under an hour (the swell 99 Percent Invisible podcast from Roman Mars usually manages to cram a bunch of fascinating facts about architecture and design into 15 minutes or less). Some of our favorites that we think you might enjoy include the excellent trivia podcast Good Job, Brain and Radiolab, a radio show/podcast about science and philosophy and all sorts of other neat stuff. Have your own favorites? Share them with other readers in the comments section below!